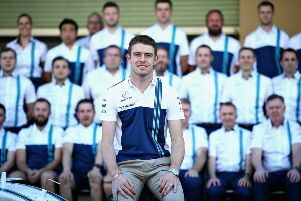 Williams have announced that Paul Di Resta will join the team as official reserve driver for the new Formula One season which gets under way in Melbourne this weekend. The 29-year-old former Force India driver takes on the role behind drivers Valtteri Bottas and Felipe Massa and he will initially spend time getting fully accustomed to the controls and procedures of the Williams Mercedes FW38. Di Resta, from Bathgate, enjoyed three seasons at Force India from 2011-2013, amassing 121 world championship points from 58 starts. He lost his seat the following season so re-joined the Deutsche Tourenwagen Masters (DTM) touring car racing series, where he raced early in his career, competing for Mercedes, and he hopes to combine his role there with the new one at Williams. He added: “It will be a busy year combining both driving in DTM with Mercedes AMG, and attending the Formula One Grands Prix in my new reserve driver role. The 2006 European Formula 3 champion joins the British team, who have enjoyed two third-place finishes in the constructors’ standings over the past two seasons, ahead of Sunday’s Australian Grand Prix. Meanwhile, Mark Webber has predicted that Jenson Button’s future in Formula 1 will be determined by the performance of his McLaren this season. Button, 36, will begin the 17th season of his world championship career on Sunday. The British former world champion looked poised to retire at the end of last year’s campaign in which he scored just 16 points before performing a U-turn to commit to the final term of his deal with McLaren. While the British team have shown improvement in terms of reliability during this winter’s testing programme, their Honda engine still appears short on power. “He can do another season but there is a big call from McLaren and Honda as to what they can produce this year in terms of reliability,” said Webber. Australian Webber started his grand prix career, which yielded nine wins from more than 200 starts, two years later than Button before announcing his retirement in 2013. Webber, who was in contention for the 2010 championship before losing out to Sebastian Vettel at the season decider in Abu Dhabi, faced numerous calls to hang up his crash helmet. “JB has had a phenomenal career and there is nothing worse than being asked as a driver and an athlete, when are you going to retire,” added Webber, who will work as a pundit for Channel 4 this season. Button will partner Fernando Alonso at McLaren for a second year after the Spaniard resisted taking a sabbatical from the sport. l Channel 4 is the new home of free-to-air Formula 1(R) in the UK with live coverage of 10 Grands Prix this season and comprehensive highlights of every race weekend. Visit www.channel4.com/F1 for more information.